Key Difference: Joomla is a free source CMS for publishing content that contact forms and web links. Components are essentially what you see in the "main" portion of the page. Modules complement the content contained in a component; they are not intended to be the main substance of a page. Joomla is a free and open source Content Management System (CMS) for publishing content that contact forms and web links. Both, component and module are referred as extensions, and they extend the basic functionality of Joomla and add additional features. A Joomla component is a core element (central part) of Joomla. It is the main functional unit of Joomla and can be seen as a mini-application. Basically, a component always displays its results in the main body area of one’s template. On the other hand, modules are normally the other bits around the main content that is part of one’s website. It usually has fewer options that are configurable by the other end user and most of the time it does not handle any sorting of information into the database. Components are essentially what you see in the "main" portion of the page. Modules complement the content contained in a component; they are not intended to be the main substance of a page. A Component always displays its results in the ‘main body’ area of one's template. A module displays its results that cover everything of the ‘main body’. It is usually along the side, top, or bottom of the main body. The content of a page. It may even be a full application. 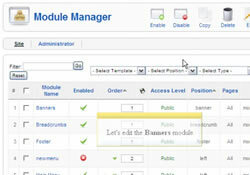 Modules typically make up the elements of a sidebar or content menus. The margin of a page that is side bar, header, footer, etc. From article submissions, to user comments in a forum will be accepted. Who’s online module, Polls module are accepted.